I was having a quiet beer one Wednesday, in a hotel in West Africa, when I received a phone call from home; "Would you like to help with a project for Time Team?" Excellent I thought to myself, should be great fun. It was then I found out that filming was on the Monday, Tuesday and Wednesday of the following week; my flight back was on Sunday morning! 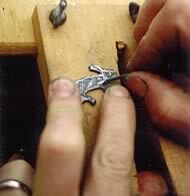 The Time Team challenge was to recreate a bronze enameled roman brooch in the shape of a hare that had been previously found on the Isle of Wight - using the same methods that would have been used for the original. There was no time for a test run and only 3 days to complete the filming. The Monday following my return was spent hunting materials to build outdoor kilns, enough charcoal to fire them and scouring petshops for cuttlefish bone (the budgie inflation rate went sky high that week). I was to be working with a bronze founder, Andy, who had been invited along for his expertise in ancient casting techniques. Between us we managed to build a working kiln by the end of day one, thankfully the cameras were concentrating on Tony Robinson and Carenza Lewis. I started cutting the lead master on day two, and it was then that the cameras turned to us. Andy had got the first melt underway while I finished the lead pattern and prepared the cuttlefish moulds. The first pour went drastically wrong as the riser and pour were too small and were getting clogged with fragments of charcoal. For the next run I took no chances and prepared six cuttlefish moulds, while Andy did another melt. This time we made a full casting but with a lot of flashing. The flashing would need trimming but it was a successful cast! 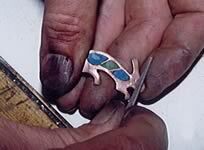 With a bronze casting made, the next process was the enameling. In order to make the enamel I mixed sand (hand dug from the local sandpit at knighton), soda (good old washing soda), a colouring agent (malachite) and an opifier (tin oxide) - a recipe described in the Mape Clavicular and Diverse Art (Theopolus). With fingers crossed we set the enamel to 'cook' over night. By the beginning of day three I had cleaned up a casting and was ready to test the enamel. The mixture prepared the previous day had formed a glass like substance which looked hopeful (huge sigh of relief on the last day of filming), so we decided to give it a go. I changed the bronze melting kiln to a muffle kiln with the aid of a square steel tube, which seemed to do the trick. The heat seemed just about right and the brooch was fired in good order. 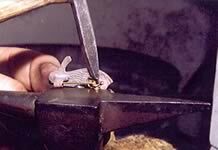 Stoning down the enamel and fitting a pin. It was a bit of a panic to stone down the enamel and fit the pin by the end of filming on day three, but Andy and I managed to get it finished and I must say the result was quite pleasing. Carenza wore the brooch to the end of shoot party.